1. Download the Code 128Font Package Demo or Sale version. The example displays the sale zip file named IDAutomation_C128FontAdvantage.zip. 2. Right-click the zip IDAutomation_C128FontAdvantage.zip and select Extract All. 3. 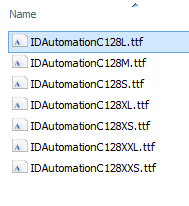 Once the process has completed, a folder will open with a folder named IDAutomation_C128FontAdvantage and a file named IDAutomation_C128FontAdvantage.exe. 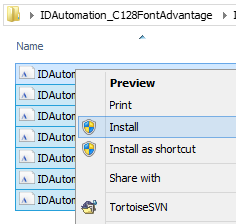 To install the fonts, double-click the IDAutomation_C128FontAdvantage.exe. Run through the installation process until it completes. If the installation does not complete, cancel the installation and run it again until it completes OR use installation OPTION 2. 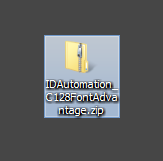 (1) Double-click the IDAutomation_C128FontAdvantage folder. NOTE: Data for Code 128 requires an encoder to format the data before applying the barcode font.